YINCHUAN, Sept. 20 (Xinhua) -- China's top political advisor Wang Yang on Thursday congratulated Ningxia Hui Autonomous Region on its remarkable achievements over the past six decades and wished the region a bright prospect of development. He made the remarks when addressing a grand gathering in Yinchuan, capital of Ningxia, in celebration of the 60th anniversary of the region's founding. Wang, a member of the Standing Committee of the Political Bureau of the Communist Party of China (CPC) Central Committee and chairman of the National Committee of the Chinese People's Political Consultative Conference (CPPCC), led a central delegation to attend festivities marking the anniversary. He said Ningxia, under the strong leadership of the CPC Central Committee, had achieved giant leaps in economic development, great improvement of people's living standard, and harmony and stability in the society over the past 60 years. He called for further efforts to realize economic prosperity, ethnic unity, beautiful environment and a wealthy life enjoyed by people in the region, so that Ningxia will step into a comprehensive moderately prosperous society together with the rest of the country. Wang stressed that Ningxia should always uphold the leadership of the CPC and the path of socialism with Chinese characteristics, and be committed to the cause of national reunification and ethnic equality. The region should also uphold and improve the system of regional ethnic autonomy, keep working for common prosperity and development through joint efforts of all ethnic groups, and insist on law-based governance, he said. 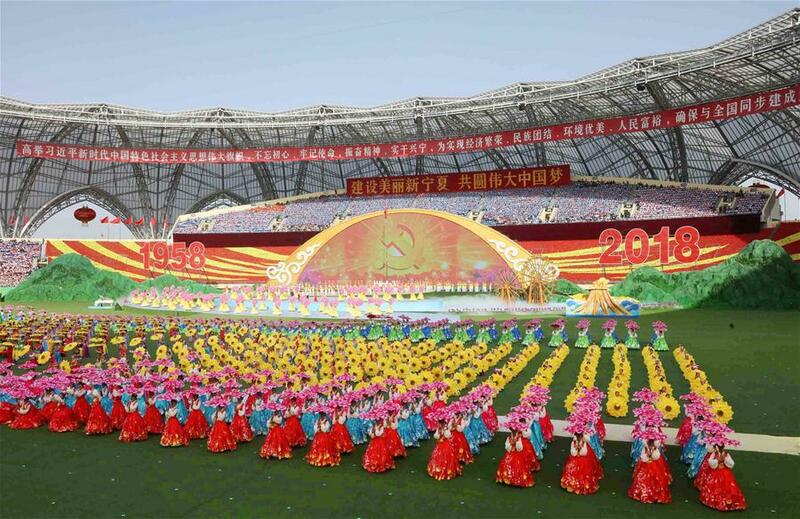 At the gathering of some 21,000 people from all walks of life who represent all ethnic groups in Ningxia, Vice Premier Sun Chunlan read a congratulatory message by the CPC Central Committee, the Standing Committee of the National People's Congress, the State Council, the CPPCC National Committee, and the Central Military Commission. Jubilant spectators waving mini Chinese national flags filled a stadium where the gathering was held. The celebration included parades with floats adorned with huge "1958-2018" banners and slogans, as well as performances representing progress made across the region, once known for its large impoverished population living in the inhospitable environment. The regional economy, measured by GDP, has expanded from 328 million yuan in 1958 to over 345 billion yuan (52 billion U.S. dollars) last year. The poverty rate was cut from more than 70 percent to six percent. "We are living in a good time," said Zhao Naixiang, a resident of Jinfeng district of Yinchuan. Zhao said the roads in her neighborhood used to be full of holes and lacked street lamps 15 years ago. "Now the environment has been improved with more trees and recreational facilities, just like a park. Every family uses clean natural gas to cook and many own cars," she said. Residents in Zhao's neighborhood are from more than 10 ethnic groups including Hui, Han and Manchu ethnic groups. "We celebrate each other's festivals and share food and joy together on these occasions. We are like a big family," Zhao said.